As likely all of you know, Haiti was devastated by a major earthquake last week. Many of us software developers wondered how we could help. Then Justin Williams of Second Gear Software came up with an idea. He thought he could donate all the sales of his software for a single day to help the relief effort, and invited other indie software developers to band together with him to do the same. This became Indie+Relief, which now has well over 100 developers participating, including Useful Fruit. The idea is simple, 100% of income from today’s sales goes to the relief effort in Haiti. Each developer chooses which charity they will donate their income to. I have chosen UMCOR, the relief organization associated with the United Methodist Church. It’s a great organization that I’ve volunteered with in the past. They are quick to respond, as well as very effective and efficient. This is because they get so much volunteer labor and the fact that the church funds their administration, so 100% of all donated funds go straight to the relief effort. So, if you’ve been considering purchasing or know someone who has, today is a good day to do it. Also, please check out the other apps that are part of Indie+Relief. You might find something else useful to you and help some people in need in the process. Pear Note uses separate windows for separate documents as well as for slides and video (if you double-click them to make them bigger). This is by design – by making these things separate windows you are free to position them however you like. Also, tools like Exposé are useful when you put things in separate windows. This works pretty well. That said, lining up windows can be a bit painful, to the point that people often won’t do it and they’ll have windows partially overlapping. I’ve long wrestled with this, but recently the folks at Irradiated Software released some apps that are great at making this easier. These tools all allow you to line up windows with very simple actions. I’m using SizeUp myself, which gives you a bunch of keyboard shortcuts to position a window on the left, right, top, or bottom half of the screen, as well as into the quadrants (pictured below) and on specific monitors. They’ve also got a lite version of it called TwoUp and one that is mouse driven rather than keyboard driven called Cinch. I don’t know the developer or have any vested interest in this software, but I think it’s a great tool that is especially useful with Pear Note. 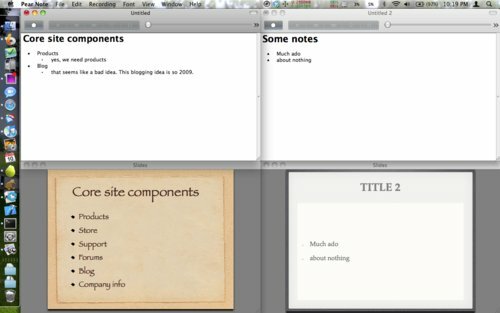 If you find yourself looking for a tool to make it easier to line up notes next to one another or slides and video, check them out.